Max has been getting gutsy about trying new things. Maybe it's the confidence that comes with getting older, or that he's getting more in control of his body. Whatever the reason, it's awesome. Monday afternoon at Keystone Resort, the awesome family resort we recently visited, Sabrina and Dave had plans to go ice-skating. I was going to ride a ski gondola with Max (a favorite activity) except he decided he wanted to try skating. Our condo looked out onto a beautiful frozen lake; Max had been watching skaters twirl around for days. Thing was, I knew he wouldn't be able to hold himself up on ice-skates. Not because I doubted his determination (that, I have no doubts about) but because I knew he'd have issues with balance. But into the ice-skating center we went. Max immediately spotted a red walker used to train kids to skate and pointed to it. I looked at the guy behind the counter and explained that Max wouldn't be able to balance on skates. 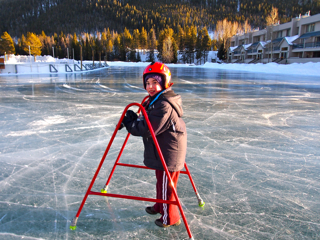 "He can just walk across the ice with the walker," Ice Man said, matter-of-factly. I asked if that was safe. He told me Max would be OK if he shuffled his feet instead of lifting them. Me, too, because I was going to be walking beside him. I'm not coordinated enough to skate and manage Max, although I probably could chew gum and skate if I tried. I showed Max how to shuffle. I helped him walk down the stairs to the ice. I stepped on first, situated the walker, then guided him to it. Max had a helmet on, but I was scared he'd fall and hurt himself. Max grabbed the walker and started shuffling, like he'd been doing it his entire life. He kept going for a good hour and did not fall once, righting himself the few times he slipped. He was downright gleeful. Which makes sense because he loves to push things that move, like carts and strollers. When we were done, Max wanted to take the walker home. I promised him we'd visit a rink near us. I've never seen them before but I'm betting I can either find a place that has them or buy one. And then Max is going to be a champion and I am going to be his official coach! Look for it: ice shuffling, a new Winter Olympics event! Oh, that looks like fun! A thought: Could someone tow Max for a bit, water-skier-style, while he stands in the walker without shuffling? Or help him get up enough speed to stop shuffling and glide for a few feet? I'm remembering the childhood joy of keeping my feet still and just gliding along (at Kelton's rink in the Bronx)--moving with no friction! Like flying! Even better than socks on a slippery wood floor! Wouldn't Max love to experience that? I don't think he yet has the balance to get towed, but definitely a possibility for the future! Shuffling works fine right now for him, he's totally happy with that. And if he's happy, I'm happy! You HAVE to set that video to LMAO's "Party Rock Anthem" ("everyday I'm shufuling")! So awesome! I love to see Max doing new things :) It gives me hope and new ideas for our son Zac. When Max was a baby, there weren't a whole lot of blogs but I was on an e-loop for parents of kids who had strokes. Hearing what the other kids' accomplished always gave me hope, so I know exactly how you feel. That's so awesome! Go, Max! He looks like he's having an awesome time (and I'm really impressed that you were able to take such a smooth video without wearing skates - I'd have fallen, for sure). Hope you're having a great time and say "hi" to Colorado for me. Jealous! I was gripping the ice for dear life!!! I can't believe I didn't fall. Fake skating on fake ice with fake scenery actually sounds rather awesome. Like something out of a David Lynch movie! Whoa! Man, I am way impressed with Max and that walker thingy. Honestly, I don't think I could do that. I saw him kind of slip a couple of times, and he was able to correct himself. I know I could NOT have done that AT ALL. I am very poorly coordinated on ice. I found this quite wonderfully amazing. Go Max! Max's head is going to swell from all the praise! Which is not a bad thing, given that it's a bit on the small side. He. Just a little special-needs black humor there. Yes, he IS. I think he needs the t-shirt: I'm Da Man. Wonderful!!! Such a strong young man..way to go MAX!! You can get the walkers thru this organization. How wonderful! It makes my heart melt! Seeing you out there having so much fun on the ice brightened my whole day.